“The US has a deep and abiding interest in cross-strait peace and stability. Taiwan is a reliable partner, and we appreciate Taiwan’s efforts to maintain peace and stability,” AIT spokeswoman Amanda Mansour said in a statement. “It has been our long-standing policy that we do not support a referendum on Taiwan independence,” she said, but cited a speech by US Vice President Mike Pence in October last year in which he said that the US would always believe that Taiwan’s embrace of democracy shows a better path for all Chinese. The statement came just two days after former AIT chairman Richard Bush’s public letter was published on the Web site of Washington-based think tank the Brookings Institution, addressed to Formosa Alliance convener Kuo Pei-hung (郭倍宏) over the alliance’s call for amendments to the Referendum Act (公民投票法) to pave the way for an independence referendum. The act does not allow referendums that seek to amend the Constitution or touch upon the nation’s sovereignty. Kuo’s proposal touches on the US’ national interest in peace and security in the Taiwan area, as well as its long-standing view that neither side of the Taiwan Strait should unilaterally change the cross-strait “status quo,” Bush wrote. He also warned that such a move could trigger Article 8 of China’s “Anti-Secession” Law, which authorizes the use of non-peaceful means to respond to what it deems separatist actions by Taiwan. “I am sure you agree with me that a war in the Taiwan Strait, however it began, would be a tragedy for the island and for all that its people have achieved,” Bush added. He also said that to his knowledge, US President Donald Trump is skeptical about any US security commitment to Taiwan. “At a meeting of the National Security Council on Jan. 19, 2018, Mr Trump asked his senior national security team, ‘even more than [South Korea], what do we get from protecting Taiwan?’ The implication of that question is the US commitment to Taiwan is not justified, as far as he is concerned,” Bush wrote, adding that he has not seen evidence that the skepticism has changed. One of the reasons that the US has expressed support for President Tsai Ing-wen (蔡英文) and her administration is because she is cautious and careful, he said. When asked for comments yesterday, the Ministry of Foreign Affairs did not directly respond to the AIT’s statement, but said that the government has always dealt with cross-strait relations with discretion, and a steadfast and pragmatic attitude. The ministry called for continued support from the international community for Taiwan, which it said would allow the nation to stride farther and be more determined on its path to defend democracy, freedom and sovereignty. Supporters of New Power Party Executive Chairman Huang Kuo-chang yesterday hold up placards urging people to vote in favor of Huang in tomorrow’s recall election at a rally in Keelung. 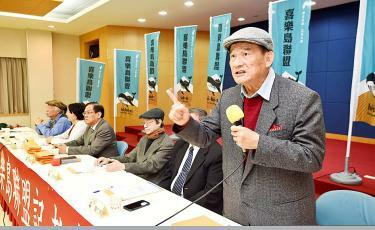 Former Academia Sinica president Lee Yuan-tseh (李遠哲) and other former officials yesterday expressed their support for New Power Party (NPP) Executive Chairman Huang Kuo-chang (黃國昌), urging people in his constituency to vote against the lawmaker’s recall tomorrow.